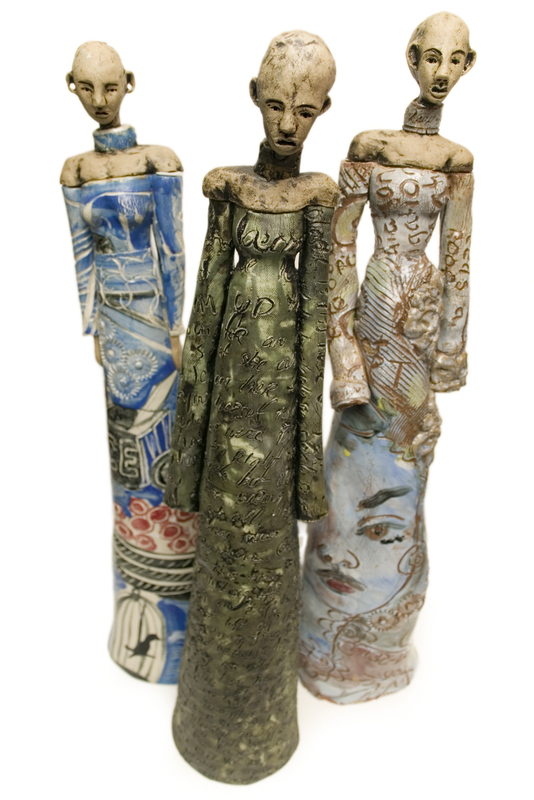 Amy Kandall’s new series of ceramic warrior princesses invite their viewers to embrace a range of contradictions. Their surfaces are at once parched dry and lusciously glazed, austere and extravagant, ugly and gorgeous, stripped down and excessive. Put into play (and sometimes opposition) is text and image, surface animation and sculptural depth, color and line. Borrowing at will from her background in painting, printmaking and clothing design, Kandall mixes metaphors and allusions while binding color to form. In their very materiality, these sculptures are made of clay that has been impregnated with color, stamped with pattern or abraded and stressed. Kandall fearlessly weaves together porcelain and brown clay, well aware of the visceral associations conjured by muddying or fusing her ceramic references. Color, in these works, is not mere surface: it is of the very fabric of the clay. Erasing boundaries or associations of the refined and the earth-bound, the clay becomes a fabric that is woven, hung and folded about these forms. As it strengthens, binds, conceals and reveals the female figures within its drapery, it is insistently sculptural. 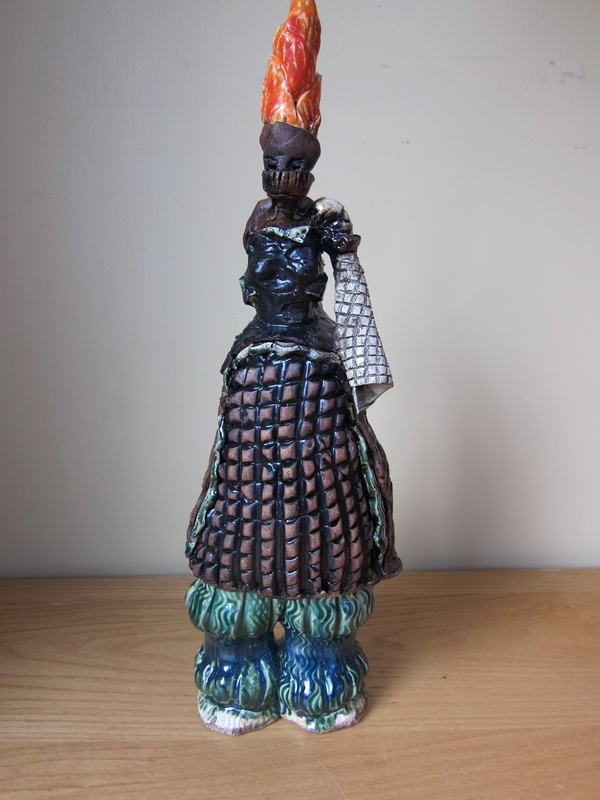 Clay is metal, cloth, hair skin; clothing is made of fictive brocade, silk or chain mail armor; clay reads as alternately soft and draping or hard and encasing. Both archetype and architecture, the female form is encased in clothing, being at once in a tower and the tower itself, both clothed and contained in these fantastic costumes, as if decorated and armed for an unnamed ritual. Formal regalia seemingly empowers the wearer: supports her yet ensnares her, tells her how to behave and silences her critics. The female body is returned to repeatedly in this work—the body as the place of memory, the embodiment of memory, and as the surface upon which life’s stories are inscribed. 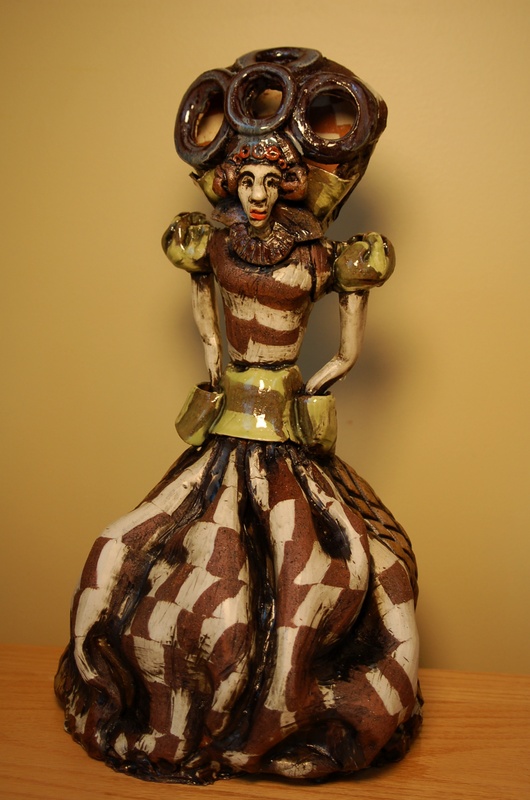 These elongated female forms evoke ancient feminine archetypes—like the Minoan Snake Goddess or Aztec devouring mothers. At the same time, their battle gear, their transformative armor, their mutations and amputations evoke the post-apocalyptic landscape of Mad Max. Kandall’s armored warrior princesses, evil queens, mother warriors, and wounded heroines tell stories, stories written on their bodies.